I ’m standing on the shores of Lake Tanganyika, soft white sand under my toes, a warm breeze whispering from the west. The sun is setting somewhere over the horizon, beyond the crystal waters, a spectacle of dazzling yellows and pinks slipping into blue. Behind me are the thickly forested peaks of the Mahale Mountains, home to untold secrets of our past. This is the beating heart of Africa: remote, wild, lost. Best known for : Chimp trekking. The mountains are home to about 800 chimpanzees, the world’s largest protected population of the eastern subspecies of the animal. How to get here: Mahale is very remote; access is by chartered or scheduled flights and a 1.5 hour boat transfer. Where to stay: Greystoke Mahale. With stunning beach and lake views, sashimi sundowners and starlit dinners, Greystoke is wilderness touched by style. In one word: unmissable. When to go: Open year round except April and May. Each season has its own charm. Children: Over the age of 8 permitted at camp. Age 12+ are permitted to go chimp trekking. Greystoke Mahale, my home for the next few nights, is a speck on the western fringes of Tanzania within the protected Mahale Mountains National Park. The Mahale Mountains, along with Lake Tanganyika, the second deepest lake in the world, are an extension of the Albertine Rift, the slow shift in the tectonic plates of the African continent. As the earth tears apart, lakes and mountains emerge, home to stunning biodiversity that is impossible to find elsewhere. This is as far away from the open plains of the Serengeti as my imagination can take me. The magical Mahale Mountains are home to many animals, including leopards, bushbucks and several species of primates. But the true quest of our trip is an unforgettable trek in search of chimpanzees. There are no roads here; we must follow the ancient forest paths, our guides pointing out the language of the bush: a print here, the chewed carcass of a fruit there, and finally the cries of a tribe of chimpanzees. 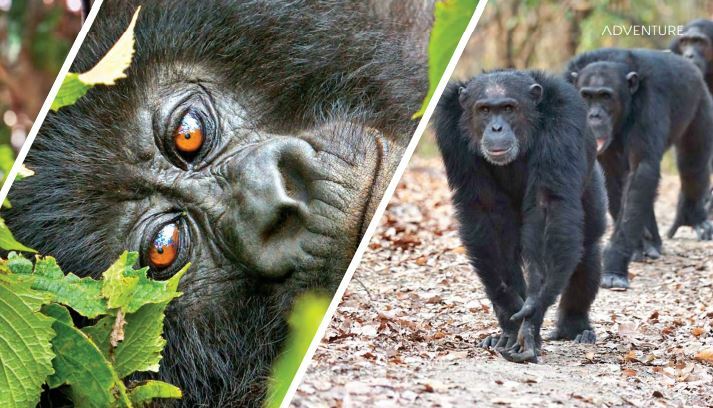 Mahale is home to one of the largest populations of wild chimps and before us, on the ground and in the trees, are a habituated community known as the M Group. Our guides introduce us to the chimps by name and regale us with stories about their interpersonal relationships. Seeing their behaviour and expressive faces, I am stunned: it’s like looking into a mirror. 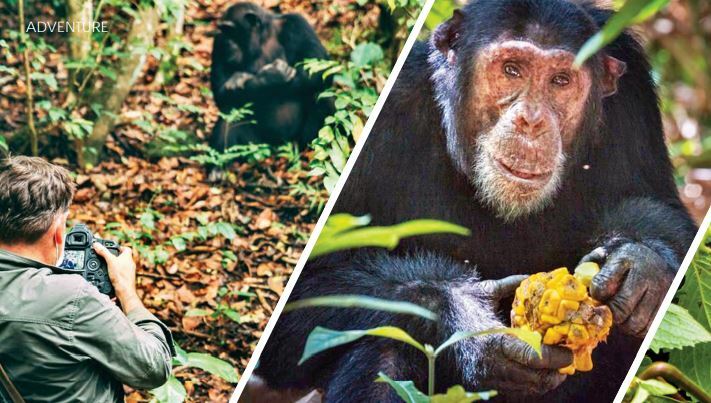 Genetically, there is very little that separates us — yet, only future history will tell if the endangered chimpanzee, already extinct in four countries, survives against human pressure. Best known for: Chimpanzee habituation experience. Where to stay: Rubondo Island Camp is the only lodge on Rubondo Island. It offers other activities like boat safaris and wetland excursions as well. How to get here: Flights available from the Serengeti and Kigali. When to go: Open year-round except April and May. Tracking maybe difficult during the wet season. Birding is best from December to March. Children: Over the age of 5 permitted at the lodge. There is a minimum age for the chimpanzee habituation experience. Another remote spot to see chimps is Rubondo Island National Park further north. Situated on the southwest edge of Lake Victoria, the second largest lake in the world, the park is only a short flight from the Serengeti and easily combinable with a classic Big 5 safari. Rubondo Island is cloaked by verdant tropical forests in all shades of green. Elephant, giraffe, and sitatunga, an unusual amphibious antelope, can be found here. It is also a paradise for birders — especially in the wet season. The main highlight, however, is the wild chimpanzee habituation experience. Chimpanzees were introduced to the island more than fifty years ago by the Frankfurt Zoological Society after being rescued from Europe. They thrived on the island, astonishingly without any rehabilitation. Only recently efforts were made to habituate them to humans and establish tourism in the park. The chimps here are shyer than those in Mahale, so sightings are not guaranteed. Nonetheless, it is an astonishing opportunity to be a part of a pioneering experience.